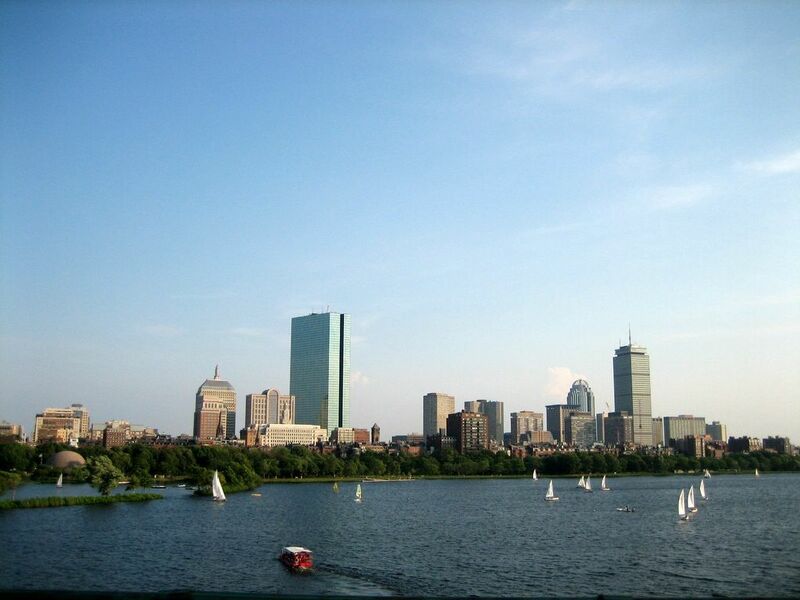 Boston is one of the oldest, wealthiest, and most culturally significant large cities in the United States (source: Wikipedia). 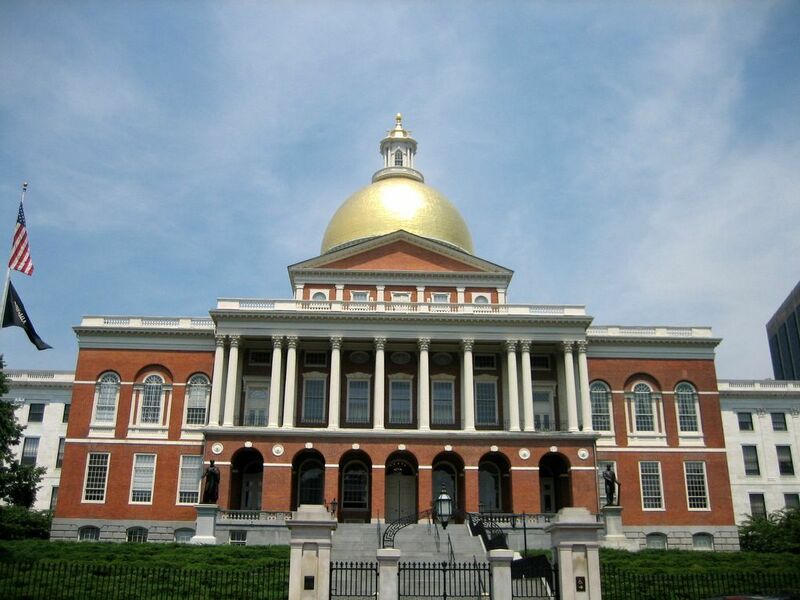 The Massachusetts State House in Boston. 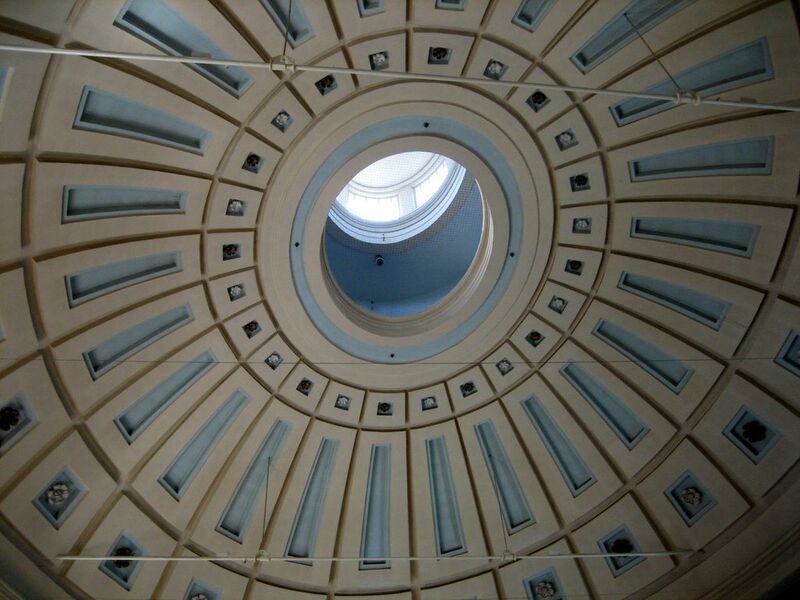 The golden dome was covered in gray fabric during the WWII to avoid being a target for enemy planes. 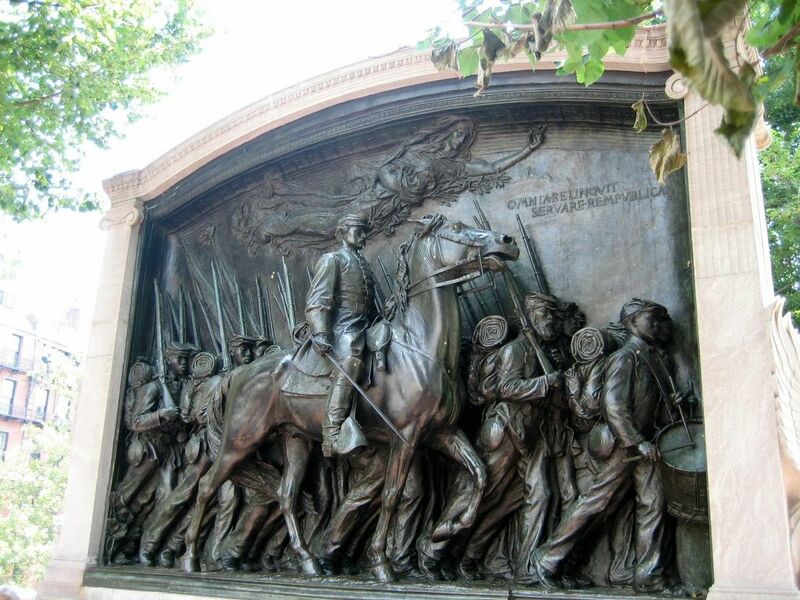 This monument just opposite of the State House is dedicated to the first U.S. Army unit made of African American soldiers. 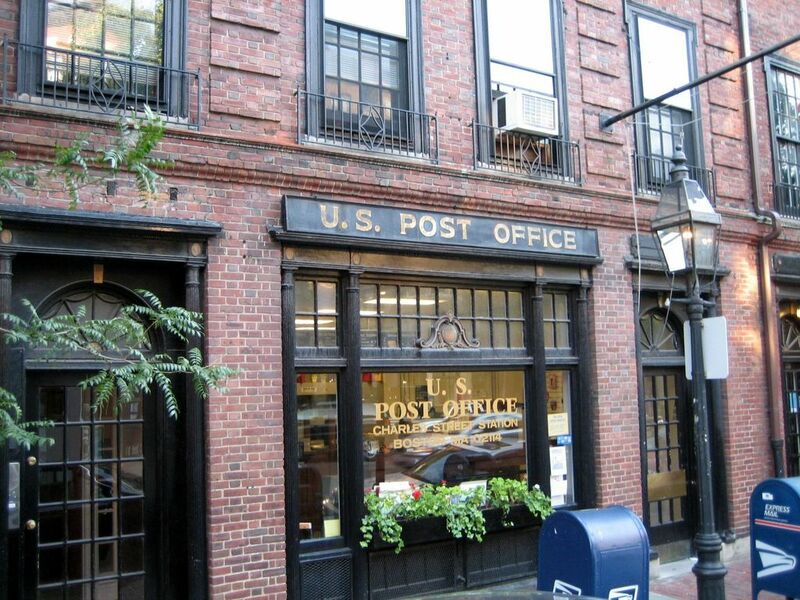 The first post office in the U.S. is on the historic Charles Street in Boston. 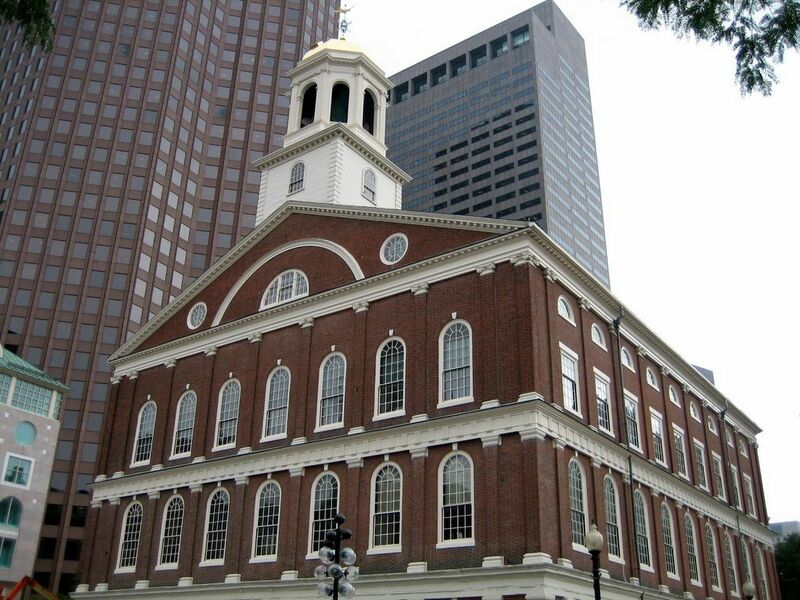 Note that zip codes in Boston start with "0" just because the numbering started from here. 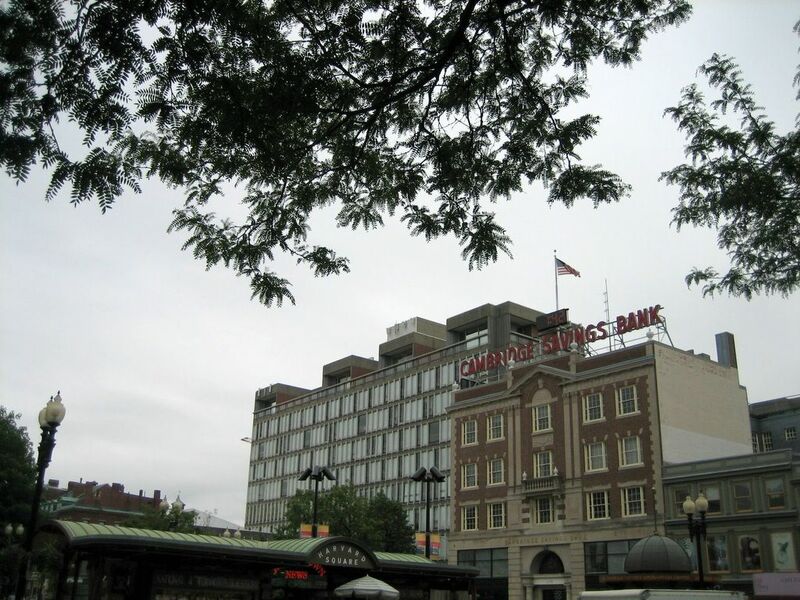 For example, the zip code of the Charles Street station is 02114 compared to 44145 for downtown Cleveland. 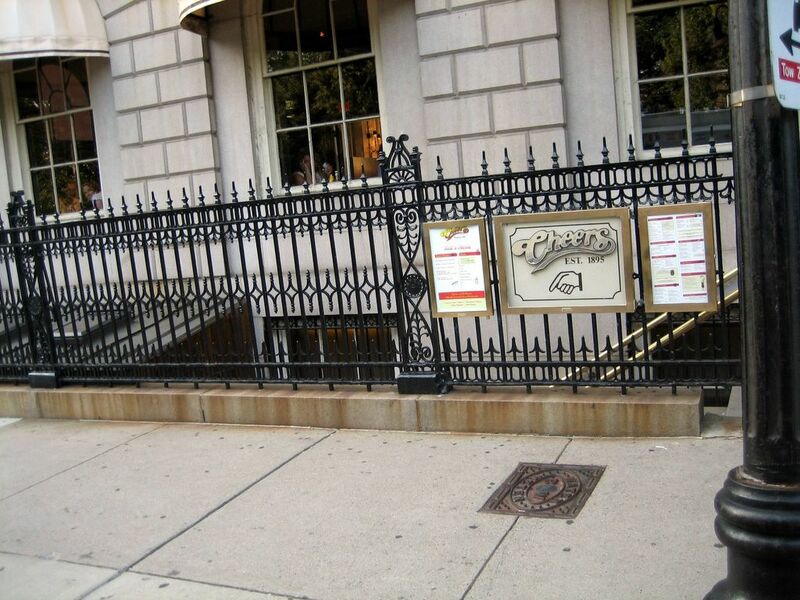 Cheers bar, "where everybody knows your name", is still alive and well, located just across from the Boston Common garden. 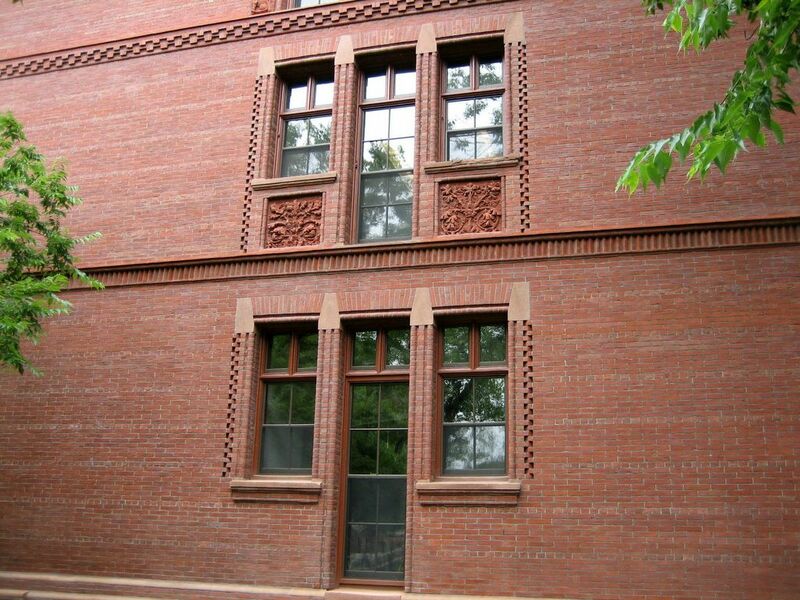 Only the first 2 episodes of the TV show were actually shot here, the rest of them were filmed in Hollywood. 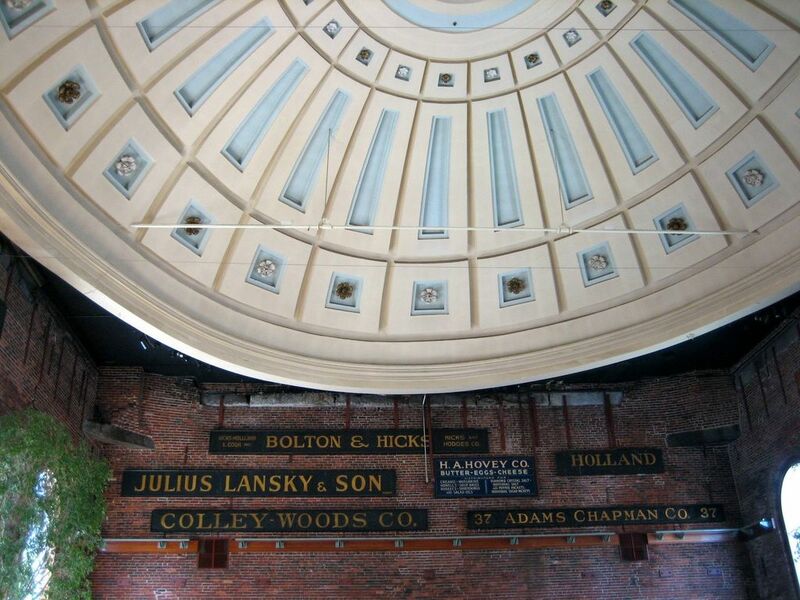 The dome of the Quincy Market in downtown Boston. 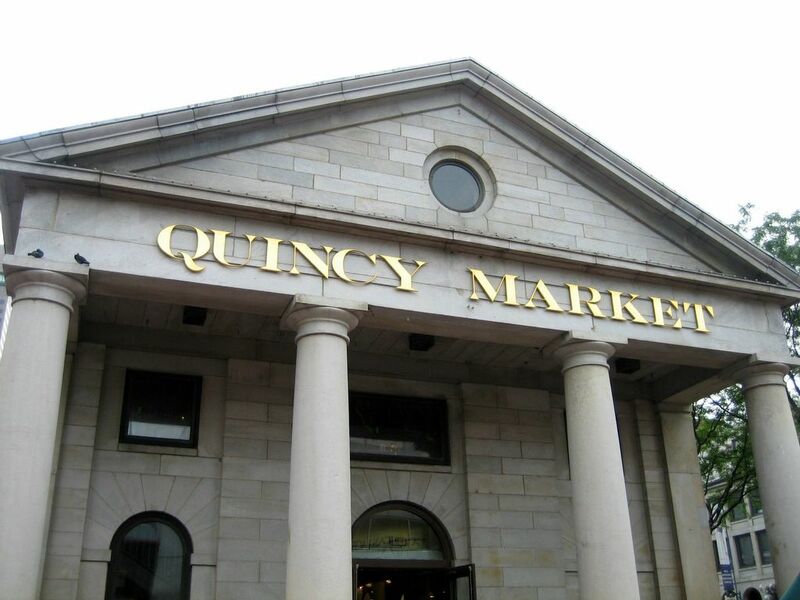 Quince Market is a historic building and a shopping center also called Faneuil Hall Marketplace in downtown Boston. 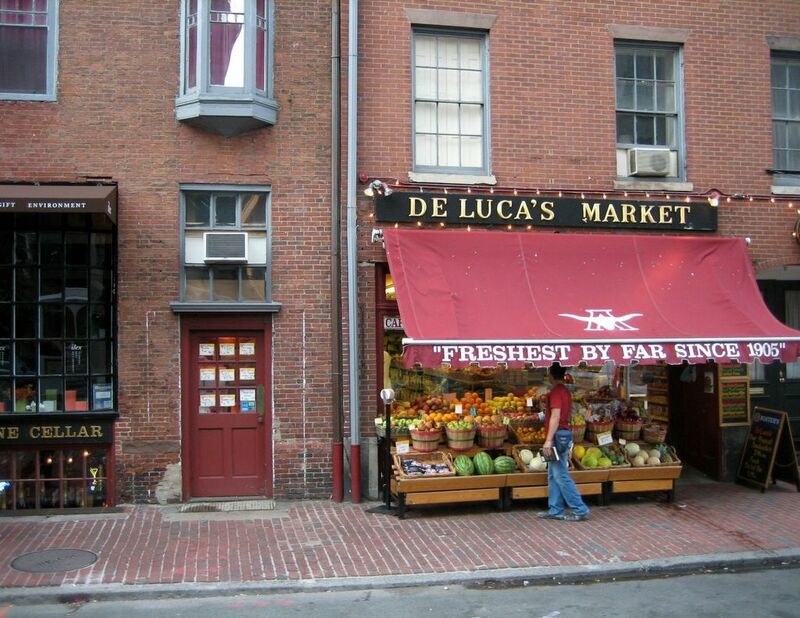 More than 40 food-stall "restaurants" are located in Quincy Market. 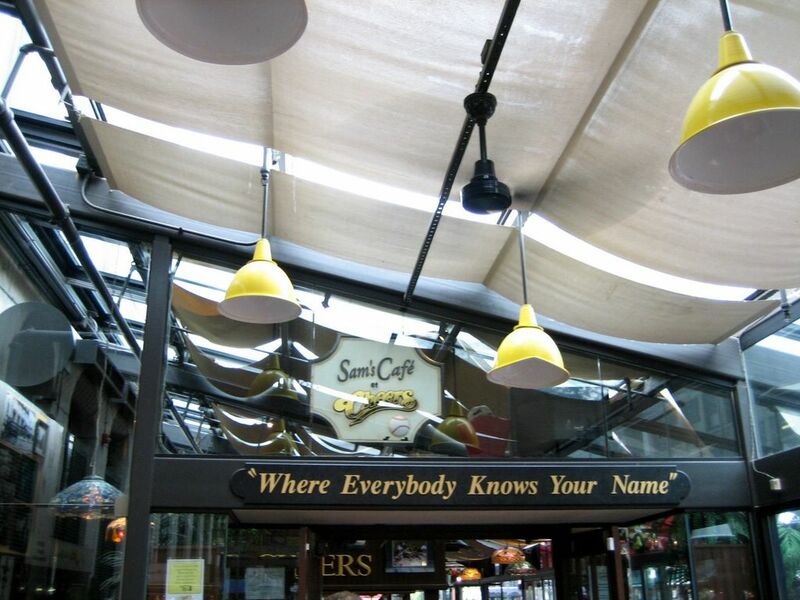 Steve's Greek Cuisine restaurant is especially good. 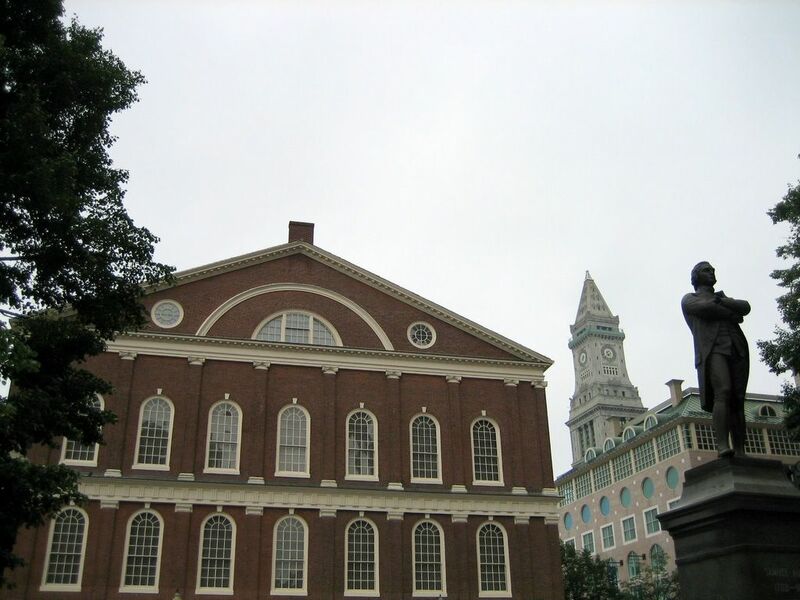 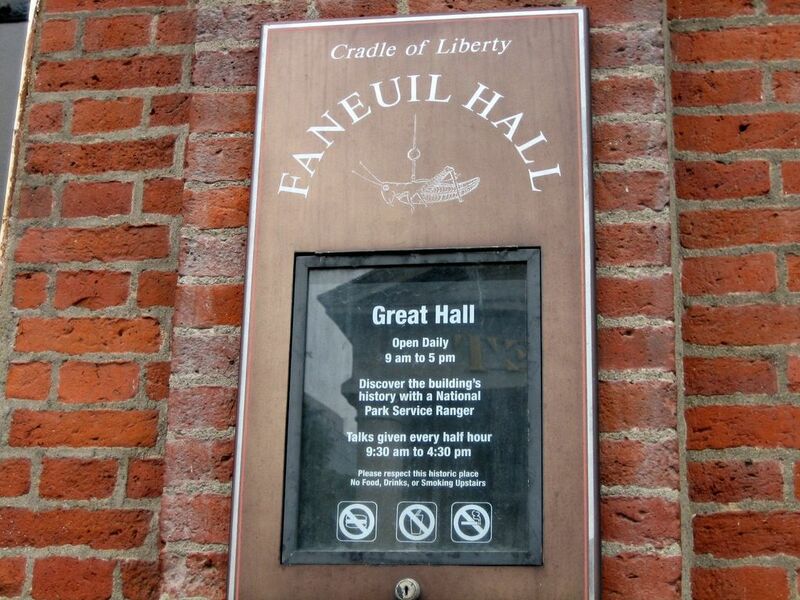 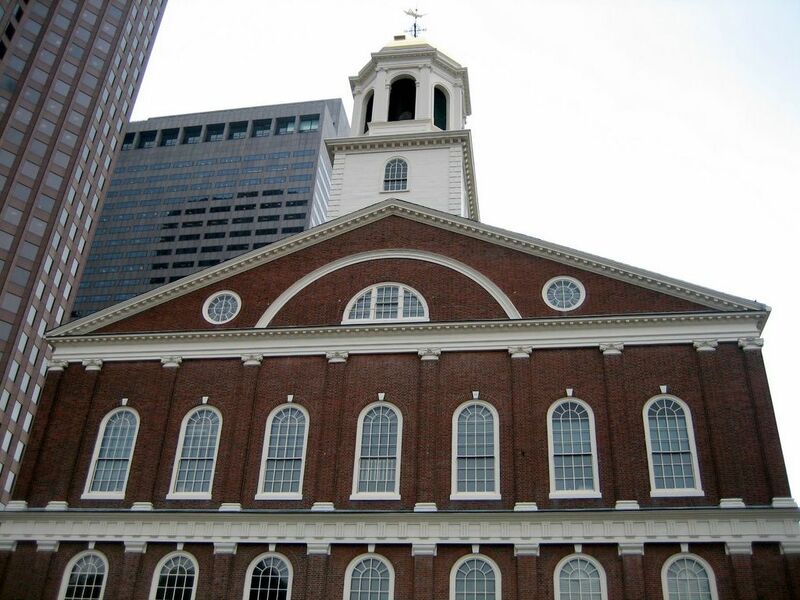 Faneuil Hall, located near the waterfront has been a marketplace and a meeting hall since 1742. 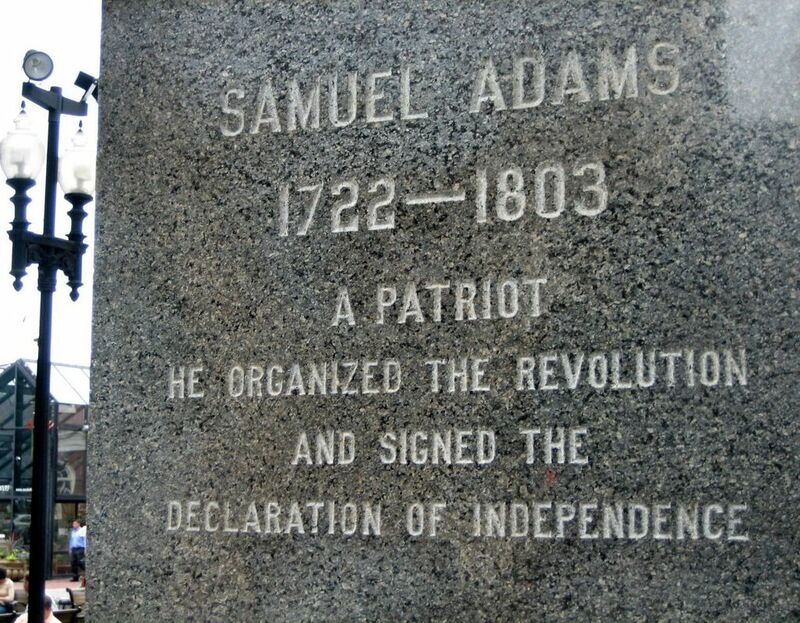 It was the site of several speeches by Samuel Adams and it is also known as "the Cradle of Liberty" (source: Wikipedia). 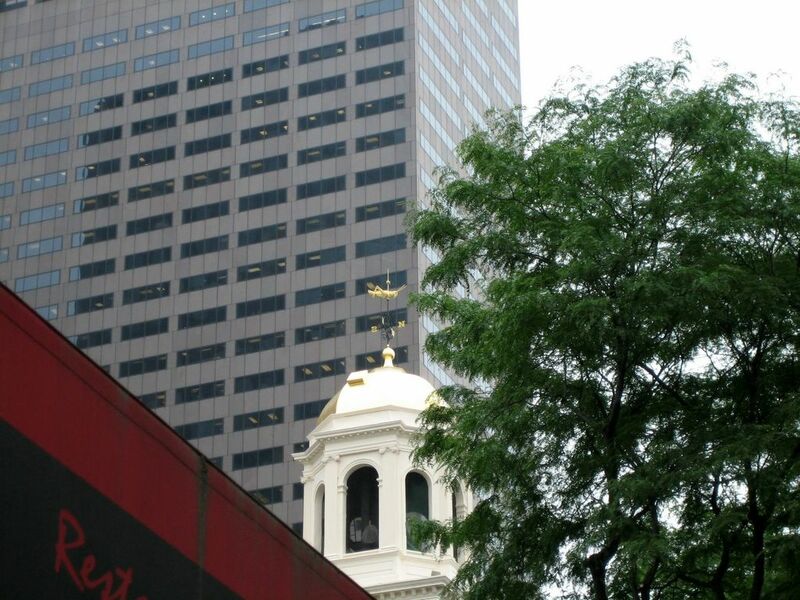 The grasshopper weather vane on top of faunal Hall is a well known symbol of Boston. 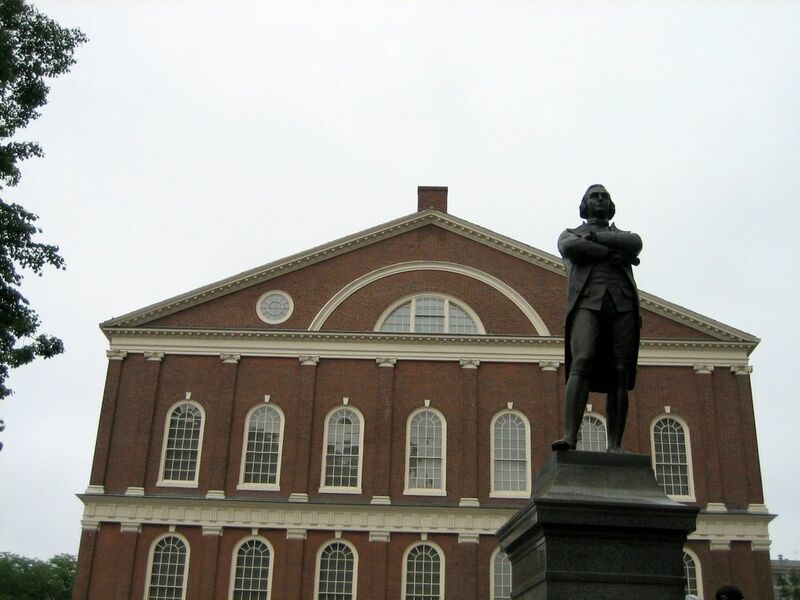 During the Revolutionary War, the weather vane was used as a lie-detector for potential British spies. 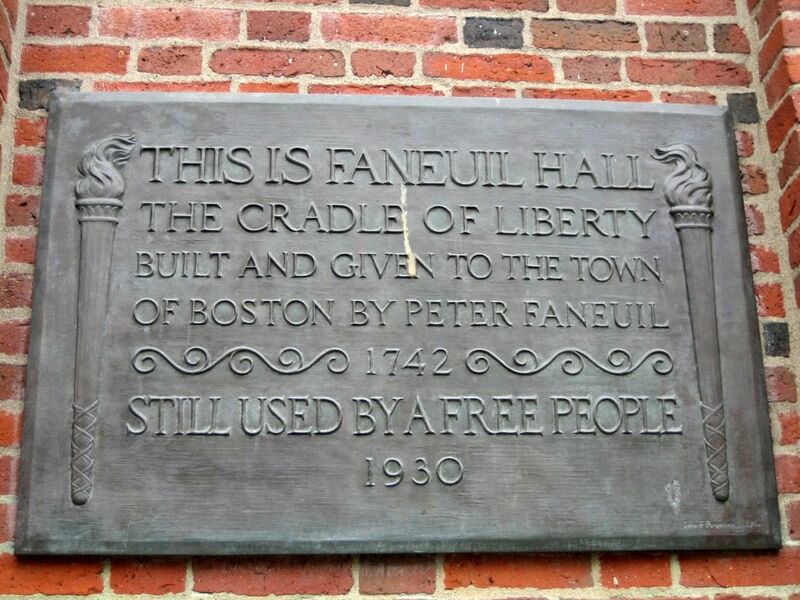 An individual was definitely not a Bostonian and possibly a British spy if he did not know the identity of the unique item atop faunal Hall (source: Wikipedia). 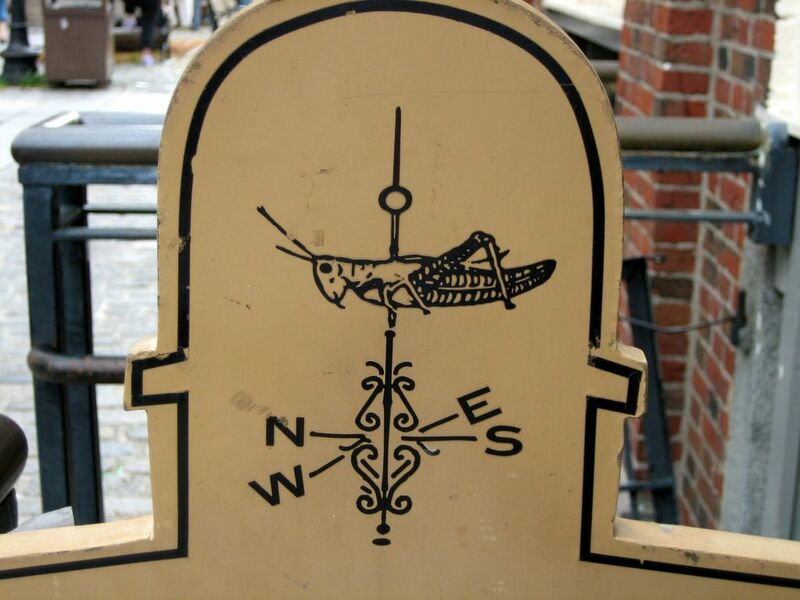 The grasshopper weather vane is made of copper and gold leaf, it measures 52 inches long and weighs 38 pounds. 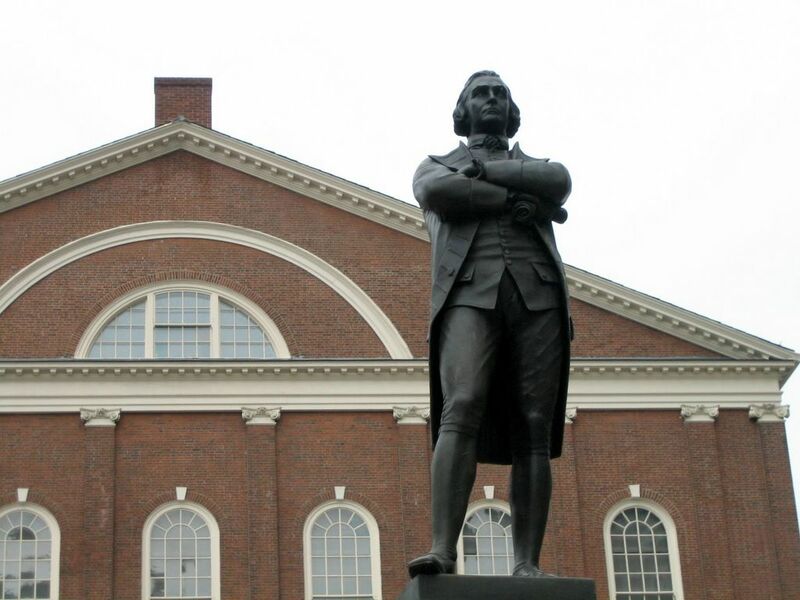 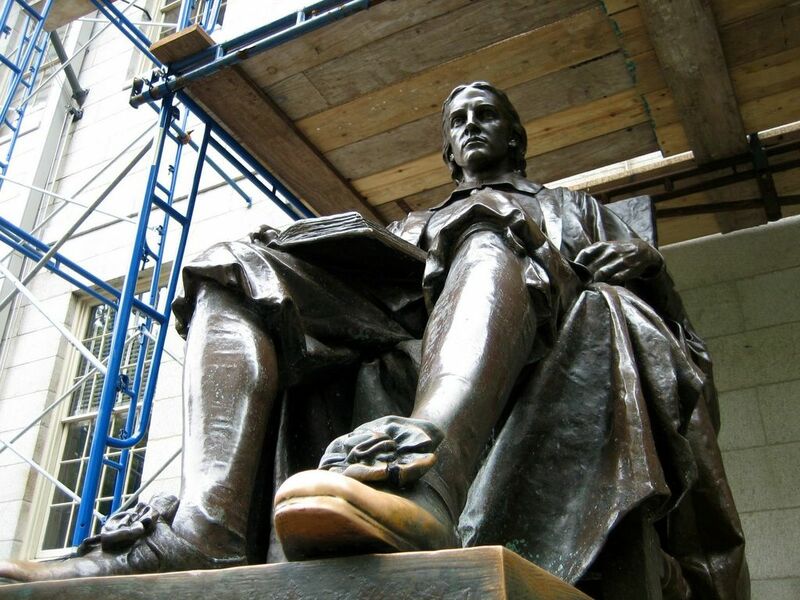 The statue of Samuel Adams in front of faunal Hall. 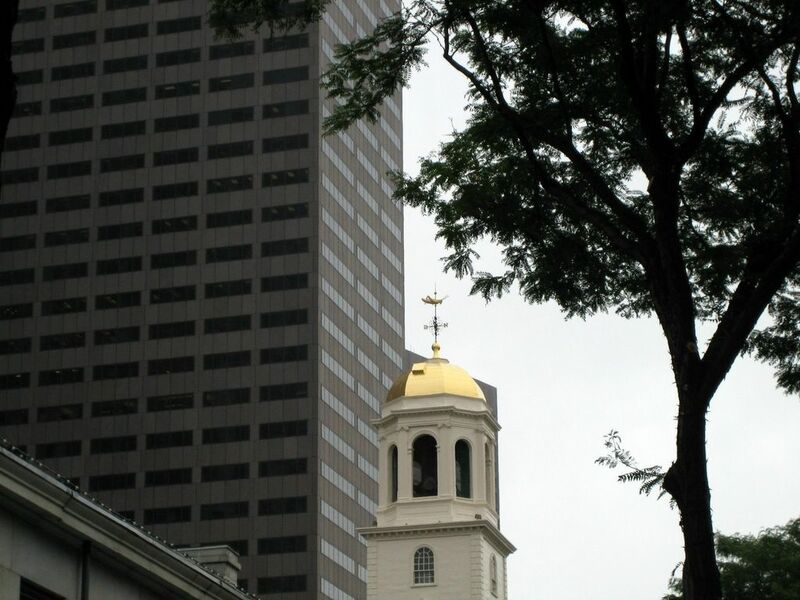 Trinity Church and the John Hancock Tower behind it. 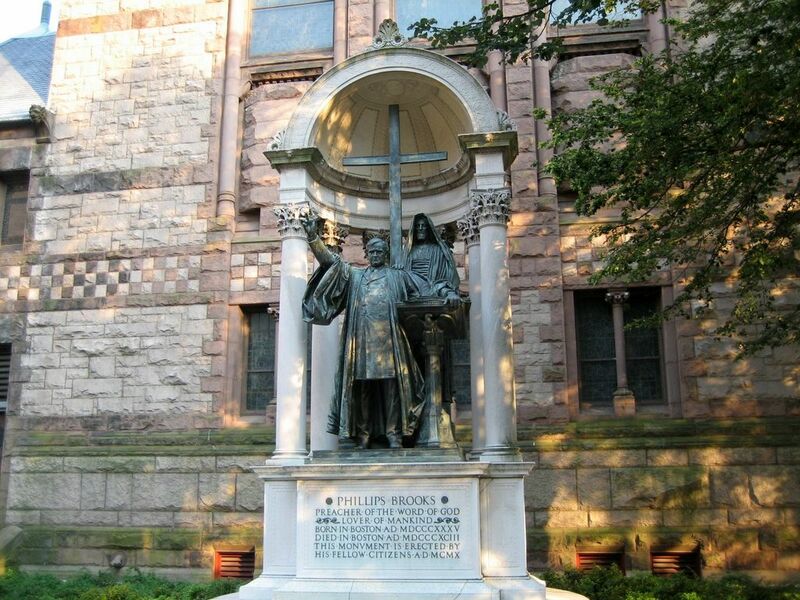 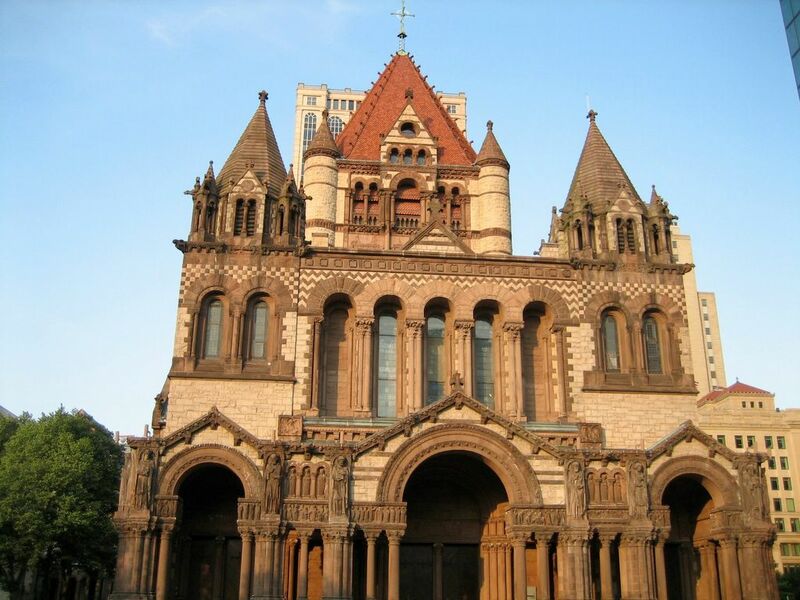 Trinity Church was voted one of the 10 most significant buildings in the United States by the American Institute of Architects (AIA). 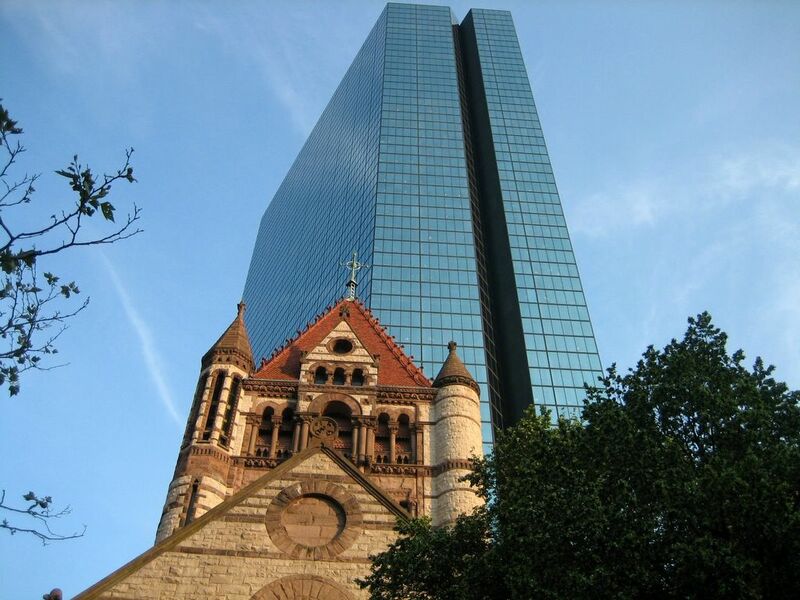 The Hancock Tower was plagued by engineering problems including falling glass and significant sway by the wind. 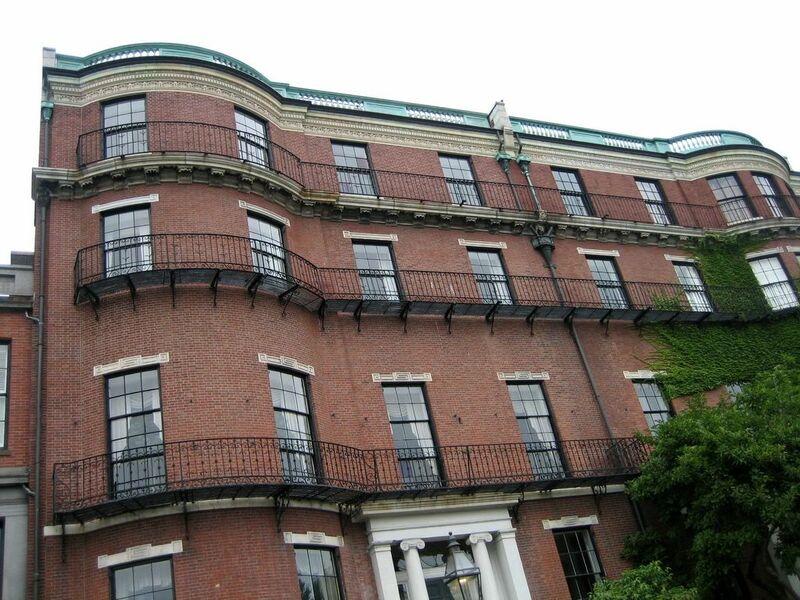 All windows had to be replaced with glass that was 1/2 inch ticker and a large counterbalance weight had to be placed on one of the upper floors to eliminate wind sway. 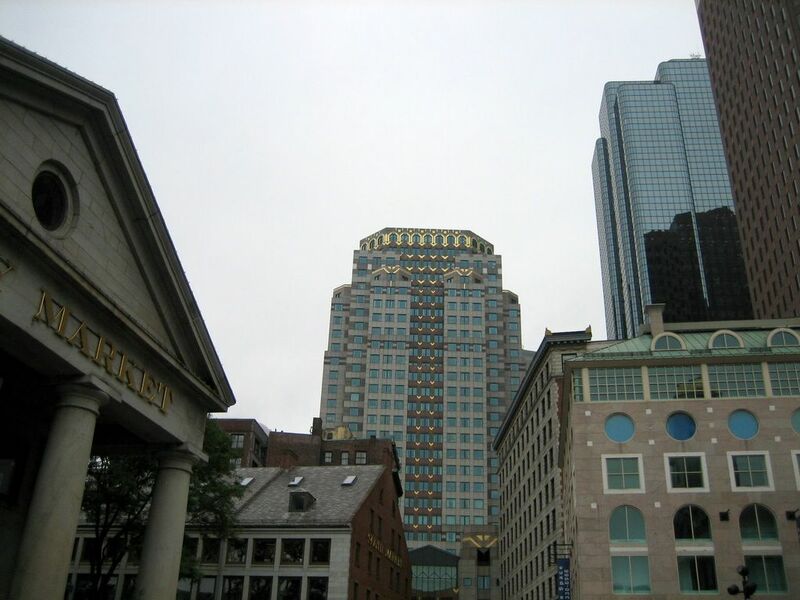 The Main entrance of Massachusetts General Hospital. 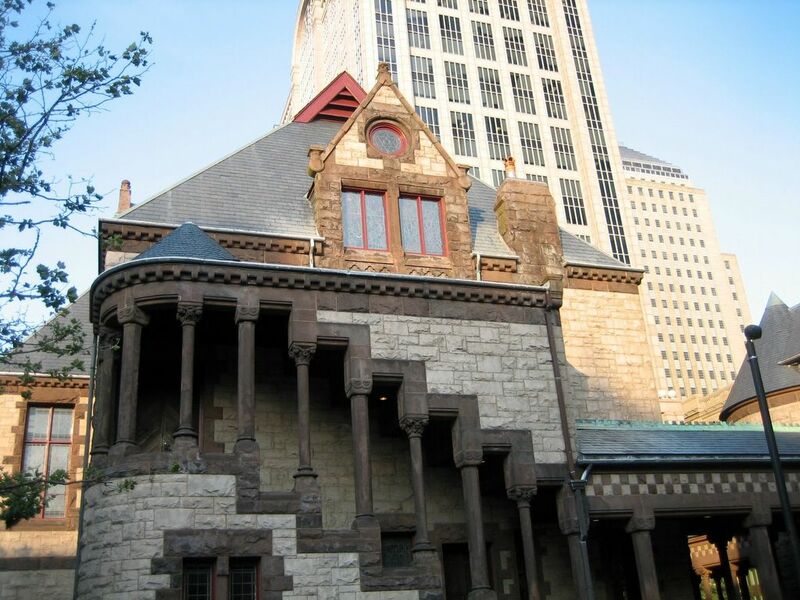 It was at MGH in 1846 that general anesthesia (with ether) was first used in medical practice. 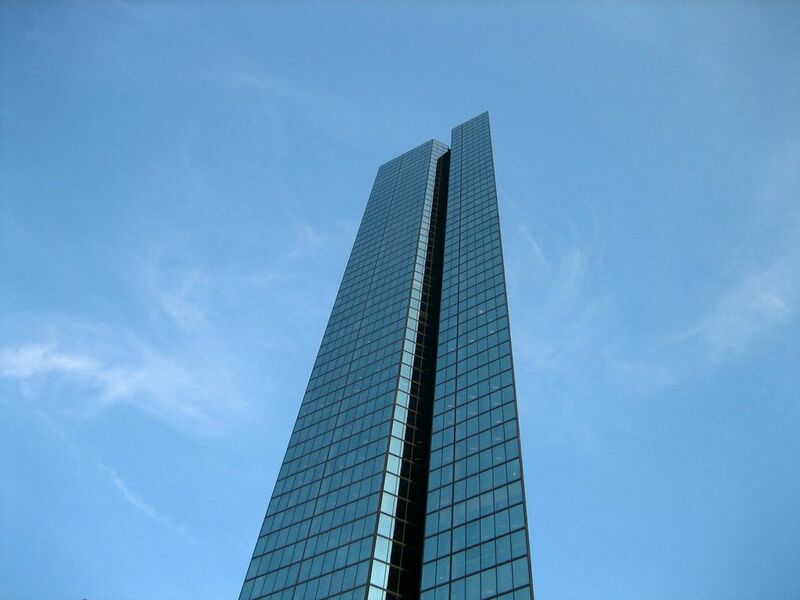 With more than 10,000 employees (Cleveland Clinic has 22,000), the hospital is the largest nongovernment employer in Boston. 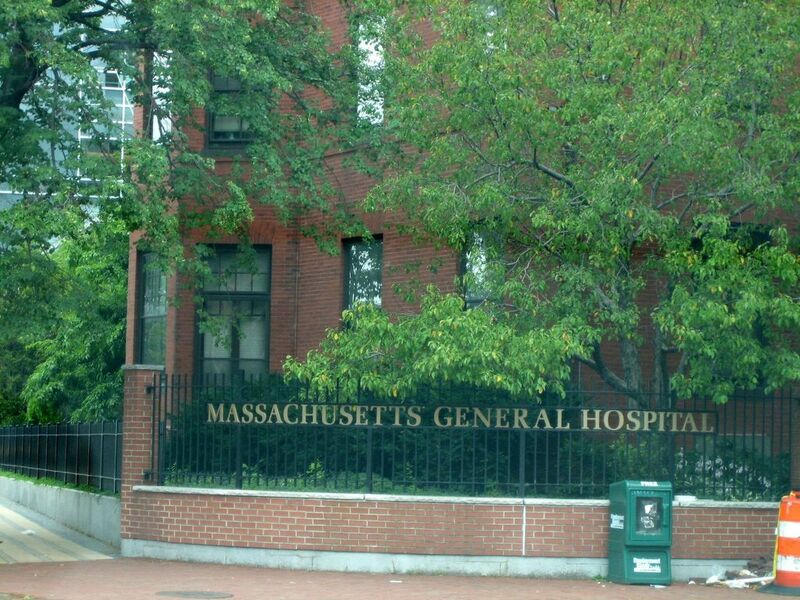 MGH is considered one of the best hospitals in the world (hence the in-jest nickname, "Man's Greatest Hospital"). 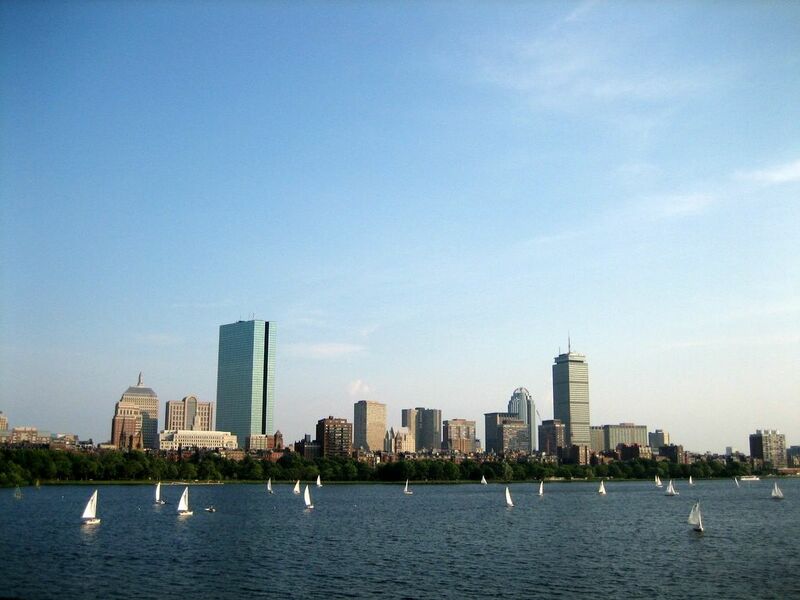 It consistently ranks as one of the country's top hospitals in U.S. News and World Report. 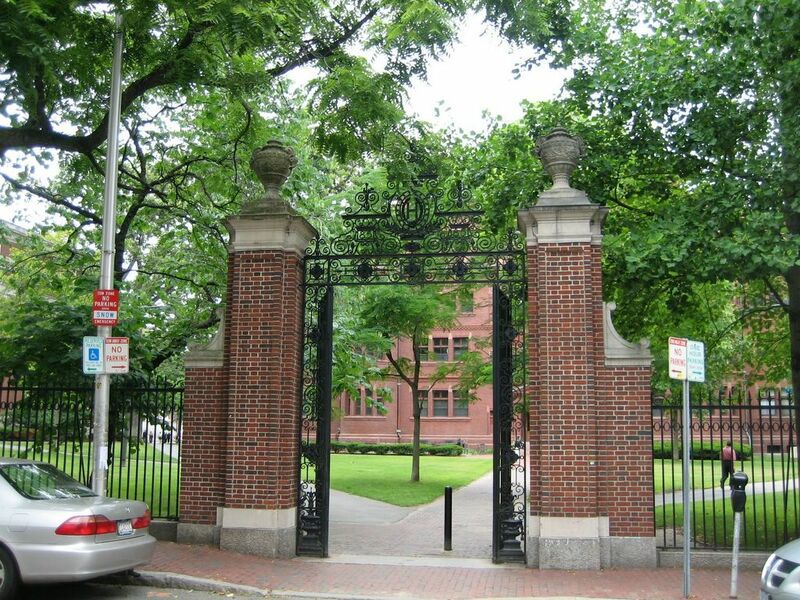 In 2006, Cleveland Clinic took the number 3 spot that MGH held for years (source: Wikipedia). 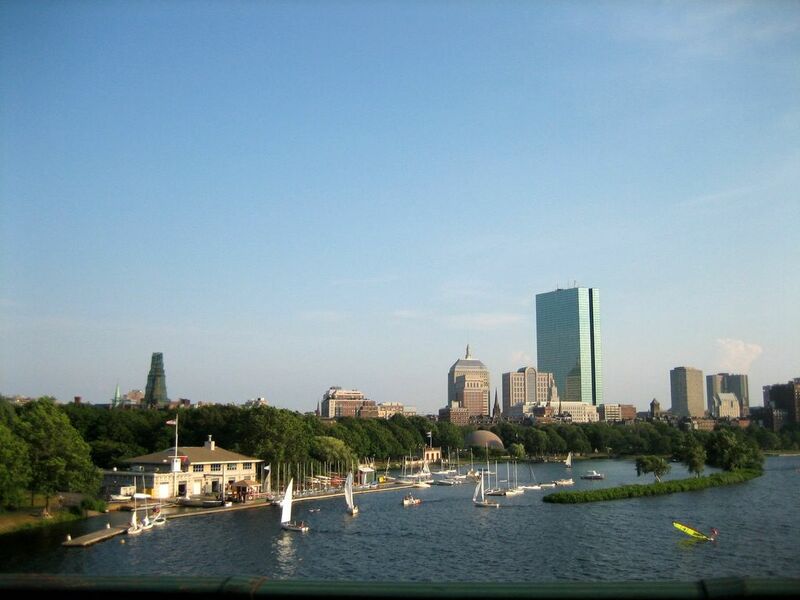 A view of downtown Boston from the Longfellow Bridge which connects Boston with Cambridge. 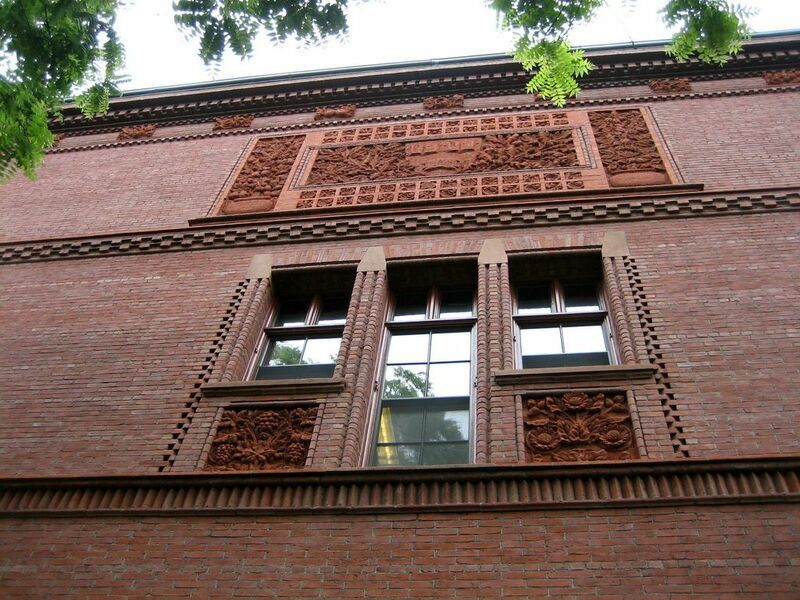 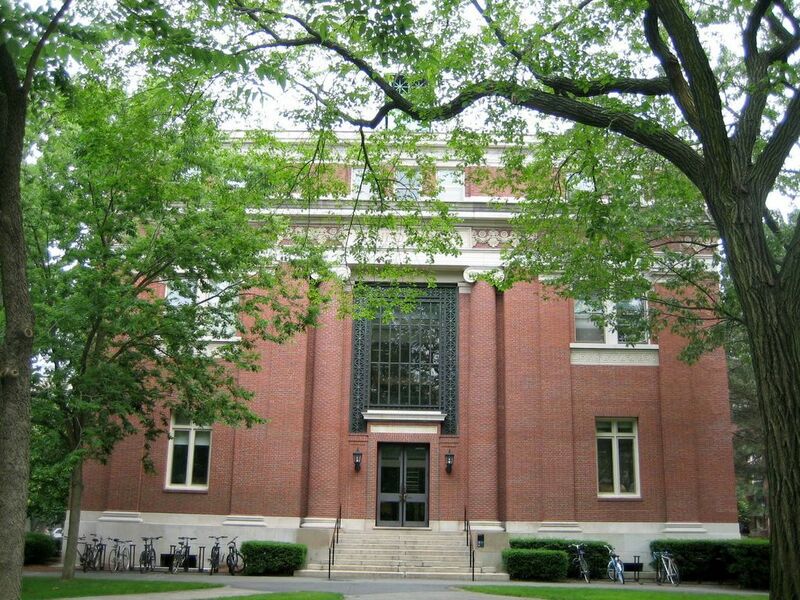 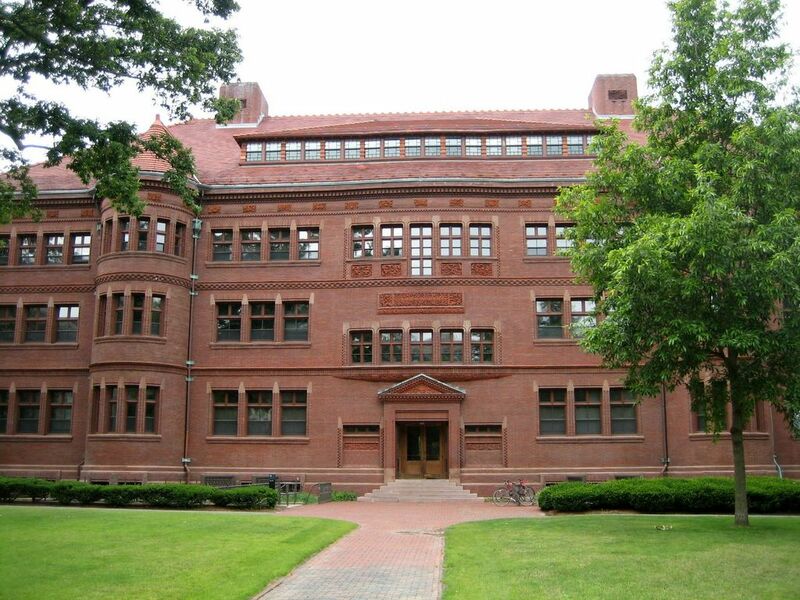 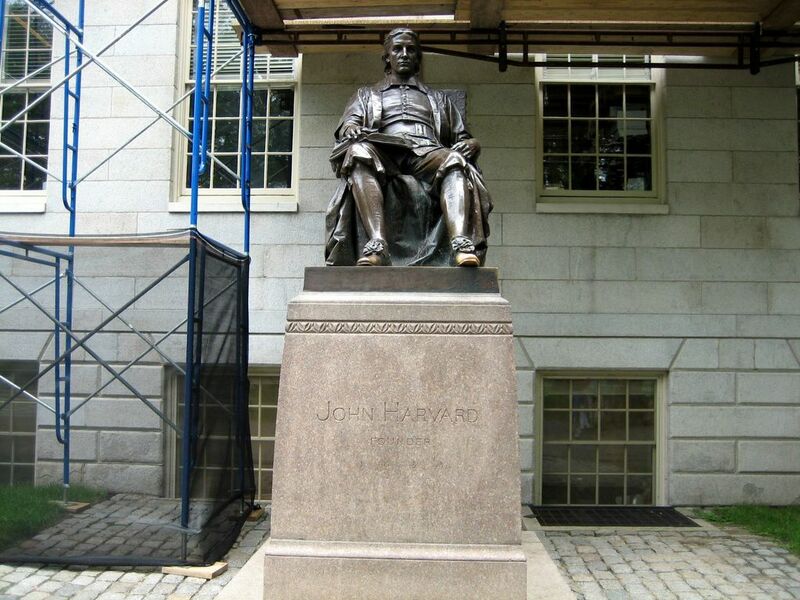 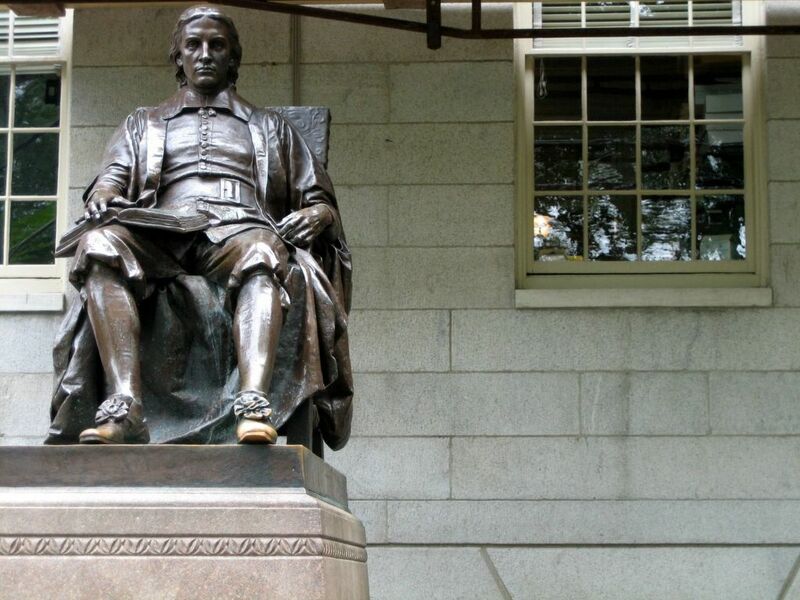 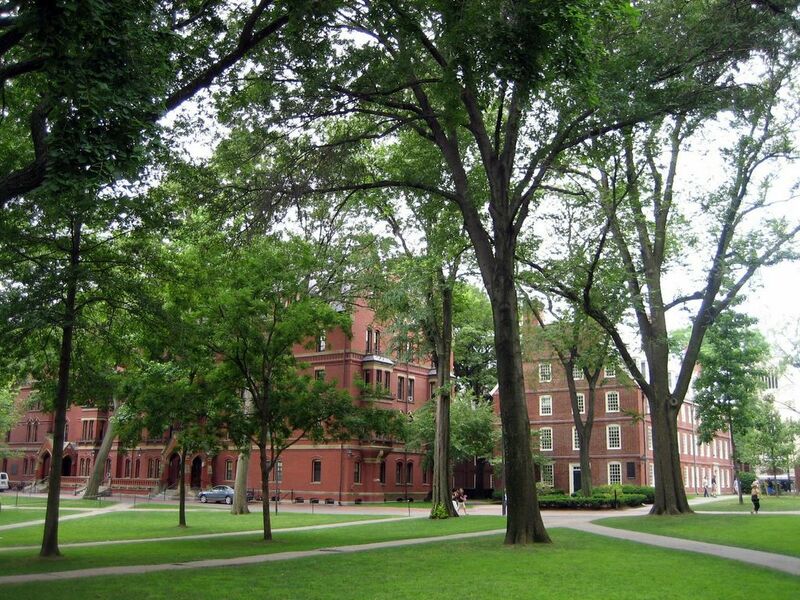 The Harvard university and MIT are located in Cambridge, MA. 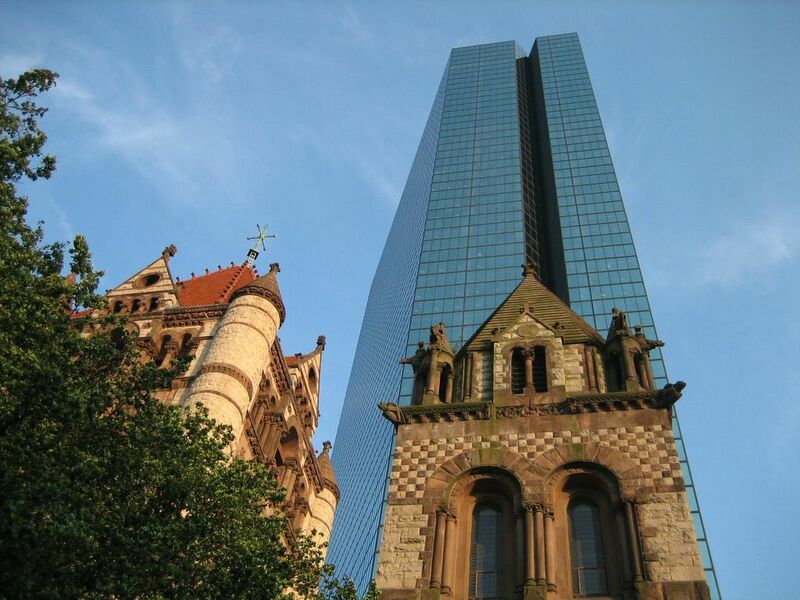 This post really nice post which depicts the glory of Boston. 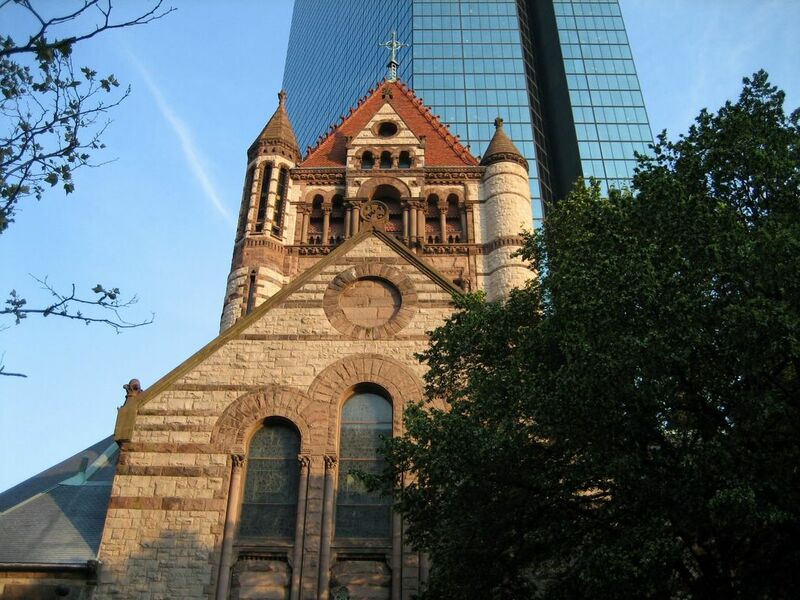 I visit this page while I am searching a place to travel in my upcoming vocations. 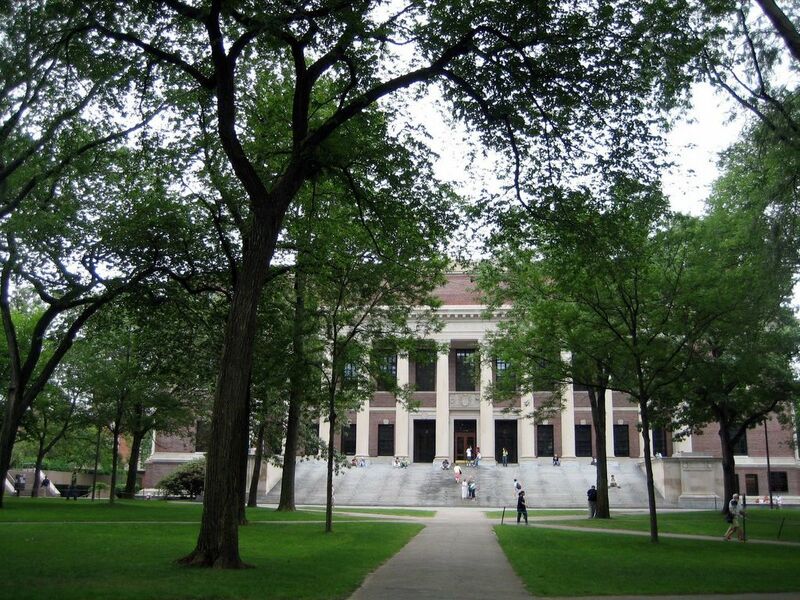 Now I am also considering to visit Bostan as well.